Born in New Bongaigaon on 9th November 1985 Sonia Hussain was brought up in an ambiance of social interaction where her parents Abul Kalam and Rezia Begum raised her in a pampered way. She gained her primary education in the provincial town of Bongaigaon itself and passed her matriculation from Birjhora Girls High school in 2001. 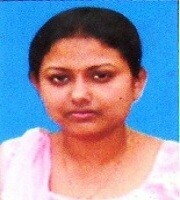 Then she secured her higher secondary education and degree from BirjhoraKanyaMahavidyalaya in 2003. After that she took the subject and discipline of education in her B.A. Course and obtained her degree from Bongaigaon College, Bongaigaon.Then she migrated to Guahati University in 2006 for her M.A degree and successfully completed her master degree from the same citadel of higher education in 2008. In graduation she secured first class 6th position under Guahati University and secured first class 6th position from the same university in M.A. She cleared NET examination at one go. She likes to read objective oriented books and listen to music. She also passed her M.Phil degree from Vinayak Mission Univeristy, Tamilnadu in 2010. This is her maiden publication.